So, after looking at the ICS G33, I've found the awesome LCT SR-3M. But the only issue is, I don't know which batteries will fit in it! I'm trying to find a 7.4v LiPo battery that will fit, but I'm having trouble with it. Most people mount the battery where the vertical grip folds into, but I dont want to do that. Any recommendations? I looked at the beauty on airsoftworld, they said they had not a single battery that would fit. If a major international retailer can't, I doubt you can, buddy. Most people mount the battery where the vertical grip folds into, but I dont want to do that. Why? The gun is wired to put the battery there, there's no space under the rear cover so where else would you put the battery? 30 seconds is all it took. Excuse me for trying to help someone after seeing a major dealer saying they can't fit any battery into it. They say that the LCT SR-3M's battery room is 15mmx25mmx75mm. Apparently, LCT was supposed to release a 7.4v and 11.1v battery that would meet those exact specifications and be of reasonable mAh. I'm trying to find the best mAh, as the highest I've seen is 950mAh from a Turnigy 7.4v lipo. Also, if batteries are so hard to find for the SR-3M, should I just get the ICS G33 instead? I was looking at that one, too. The handguard has a section for the battery to rest above the barrel, as to not stop the function of the vertical folding grip. I'd like to retain the ability to either have it folded or not. Firsupport list a battery for it. It looked a bit large to be honest but it would be worth ringing them to confirm its correct, they are usually spot on. Tamberlin I would never call Airsoft world a major retailer. They are not the worst but I wouldn't recommend them either. Fine, maybe not comparable to eHobbyasia or Evike or Redwolf, but they're still fairly big. I would've thought they had the time, money, and resources to test out a number of batteries, seeing as they will most likely test some of their rifles before shipping them. Do you know of any UK shops? They are all foreign stores, Redwolf does have UK outlet but its still a subsidiary of a foreign store. Its also expensive and the service isn't the best. Try Firesupport, Patrolbase, Proairsoft, Wolf armouries and even though I hate to plug them Zero one. 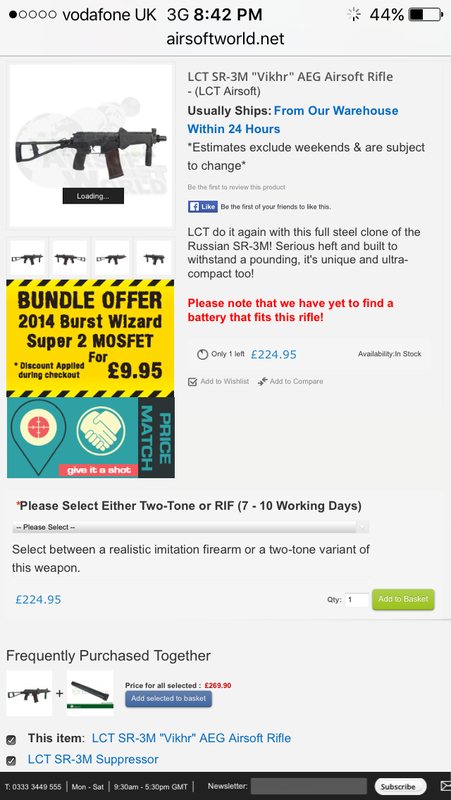 There are a plethora of good UK stores I haven't mentioned, Evike made me laugh though, they are 5000 miles away. Hmmmmm, I think that battery would mount in the reservoir for the vertical hand grip. As soon as I get my UKARA finished, I'll go down and test to see if the battery even fits. But the hunt for other batteries is still on. Of course I know UK shops, but seeing as your said 'I certainly wouldn't call airsoftworld one of the biggest' I was saying that it was fair enough that you said that, then I listed some of the biggest stores. Why're you getting at me for that? Edit: also to make it a little easier to position the cables, swap the connectors for deans ultra or mini deans connectors, it will preserve your sanity, as that is the tedious bit.